Trivandrum International Airport (IATA: TRV, ICAO: VOTV) is an international airport which primarily serves the city of Thiruvananthapuram and it's adjacent cities and towns. 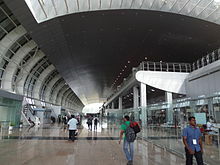 It is the first airport in the state of Kerala, India and the fifth international airport of India declared by then Prime Minister of India, V. P. Singh in 1991. It is the second busiest airport in Kerala after Kochi and the fourteenth busiest in India. In fiscal year 2017-18, the airport handled close to 4.4 million passengers, registering a fourteen percent growth from previous year. Spread over an area of 700 acres (280 ha), the airport is approximately 3.7 km (2.3 mi) due west from the city centre,16 km (9.9 mi) from Kovalam beach, 13 km (8.1 mi) from Technopark and 21 km (13 mi) from the under construction Vizhinjam International Seaport. The airport has its name for being the airport which is the closest to the sea among all other airports in India. Trivandrum International Airport operates two terminals. Terminal 1 handles domestic flight operations (except Air India) and Terminal 2 handles all international flight operations as well as all domestic flights by Air India. In addition to civil operations, Trivandrum Airport caters to the Indian Air Force (IAF) and the Coast Guard for their operations. IAF have an exclusive apron to handle all their operations. Trivandrum airport also caters to the Rajiv Gandhi Academy for Aviation Technology which carries out pilot training activities. Trivandrum International Airport hosts Air India's Narrow body Maintenance, repair and overhaul unit — MRO consisting of twin hangars for servicing Boeing 737 type aircraft, servicing mostly Air India Express aircraft. The airport was established in 1932 as part of the Royal Flying Club under the initiative of Colonel Raja Goda Varman, Consort of Rani Karthika Thirunal Lakshmi Bayi, Rani of Attingal and of Travancore Kingdom. Raja Goda Varman, a trained pilot, felt the need of an airport to accommodate Travancore in the aviation map of India and requested the Travancore Durbar to initiate the process for establishing an aerodrome. A detailed report was made and presented to the King by Consort Prince in this regard. It may be mentioned that the King was the brother of Colonel Raja's wife, and the colonel's own children were the heirs to the throne. In 1935, on royal patronage of H.H Maharaja Chithira Thirunal, Tata Airlines made its maiden flight to the airport using DH.83 Fox Moth aircraft under command of India's first pilot Nevill Vintcent carrying Jamshed Navoroji, a Tata company official, and Kanchi Dwarakadas, commercial agent of Travancore in Karachi, with a special mail from the Viceroy of British India, Lord Willingdon, wishing birthday greetings to the Maharaja. The first flight took off on 1 November 1935, carrying mails of Royal Anchal (Travancore Post) to Bombay. In 1938, the Royal Government of Travancore acquired a Dakota as Maharaja's private aircraft and placed the first squadron of Royal Indian Air Force (Travancore) for protection of the state from aerial attacks. After Independence, the airstrip was used for domestic flights with the construction of a domestic terminal: T1. 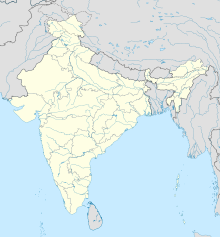 International operations were initiated by Air India to cities in the Arabian Peninsula in the late 1970s using Boeing 707. By early 80s, the then Indian Airlines started service to Colombo, followed by service to Male. Later, SriLankan Airlines (then Air Lanka) and Air Maldives (now Maldivian started operations. Followed by Indian Airlines, that started a service to Sharjah. On 1 January 1991, TIA was upgraded to an international airport, making it the fifth international airport of India after Delhi, Mumbai, Chennai & Kolkata. On 1 March 2011, the first flight operated from the new international terminal. IX 536 (Air India Express) from Sharjah marked the first arrival. Air India Express operated the first departure to Dubai from this new terminal. IndianOil Skytanking is the company which introduced single man refuelling in India and started refuelling operations at Trivandrum in March 2016. There are two terminals. Terminal 1 is for domestic (except Air India) and Terminal 2 for international flights and all domestic flights of Air India. The domestic terminal has an area of 9,200 m2 (99,000 sq ft) and can handle 400 passengers at a time. The Terminal 3 (NITB: New International Terminal Building) and the International Terminal can handle 1,600 passengers at a time. The international terminal ground operations are handled by Air India SATS Airport Services Pvt. Ltd. and Bhadra International India Pvt. Ltd. It is fully air-conditioned with wi-fi facility. The terminal features spacious lounges, natural lighting with extensive use of glass roofing and better conveyance facilities for passengers. It has three baggage carousels and elaborate immigration/customs facilities. Flemingo, India's first privately owned duty-free operator is managing the duty-free shop at the international terminal. The domestic terminal has basic amenities including cafés, a beer and wine bar, a book-seller, free local calls, phone-recharging points. Into Plane Services fueling operations handled by IndianOil Skytanking. The newly built Terminal 2 has three additional jetways and parking bays to accommodate 8 aircraft. The terminal is built opposite to the current terminal across the runway and is closer to the city side. The terminal, constructed by the AAI and designed by the UK firm, Pascall+Watson architects, is expected to provide impetus to the development of the IT sector and the tourism industry in the southern districts of Kerala. The international terminal covers an area of 35,000 m2 (380,000 sq ft). It is able to handle the passengers of three Airbus A340s and one Boeing 747 aircraft simultaneously (roughly 1500 passengers). The annual handling capacity of the terminal will be 1.8 million. The check-in area has a floor area of 950 m2 (10,200 sq ft) and the arrival area 600 m2 (6,500 sq ft). To enable the passengers to check in at any counter, a Common Users Terminal Equipment (CUTE) is installed. X-ray machines are attached to the side of the conveyor belts for faster clearance of baggage. The entrance to the terminal is from the Chaka-Eenchakkal road. A bridge has been built across the Parvathy Puthanar canal to link the new terminal to the Kazhakuttam-Inchivila NH (National Highway) 47 bypass. The new terminal has a car park area that can accommodate about 600 cars. There is a pre paid taxi service counter and foreign exchange (Thomas Cook India) counter on arrivals area. Trivandrum airport was included in Ministry of civil aviation strategic plan for 2010-2015 to upgrade as Category-A airport by developing to aerodrome CODE 4E/4F, construct parallel runway with taxiways alongside both runways and so forth. Further expansion of the airport has been planned with the AAI demanding 82 acres for the construction of a new domestic terminal and other related facilities for Trivandrum airport. The state government has agreed to acquire 18 acres for the construction of the Domestic terminal. The AAI is planning to construct a new terminal of around 40,000 square metres, which would spruce up the city airport to a 72,500-square-metre integrated terminal. Paper works, including drawing of plans, for the new terminal building have already begun at the AAI headquarters. The plan is to complete the construction of the new terminal within 18 to 24 months after the state government hands over the land to the Airport Authority of India. The AAI plans to have a three-storey structure attached to the existing terminal. The elevation of new terminal would be identical to the existing terminal building. The cargo activities at the Trivandrum Airport are carried out through the Kerala State Industrial Enterprises (KSIE), a government of Kerala undertaking). The cargo warehouse is on the airport premises. It has a capacity to import 21000 MT and export 27000 MT per annum. In 2010-11 (up to December 2010), the airport achieved MT of import cargo and MT of export cargo. The KSIE is developing a satellite cargo import facility on a temporary basis at the NITB terminal for perishable cargo handling till their final master plan is implemented for developing a huge cargo warehouse on 15 acres of land adjoining the NITB. Major cargo jets such as Emirates has begun flights to Trivandrum International Airport (TIA) . In addition to Civil operations, Trivandrum airport also caters to IAF and Coast Guard for their strategical operations.IAF have an exclusive apron to handle all their operations.Trivandrum airport also caters for Rajiv Gandhi Academy for Aviation Technology. The academy has it own hangar facility at the airport. The hangar facility can accommodate 10 trainer aircraft. The air traffic control (ATC) tower is 18 m (59 ft) tall.There are plans to build a new 50m tall ATC tower for Trivandrum airport near the new international terminal. The airport has an CAT-1 instrument landing system (ILS), DVOR and distance measuring equipment (DME). The airport is also equipped with a Mono-pulse Secondary Surveillance Radar, Air Route Surveillance Radar and an Airport Surveillance Radar which allows approach and area control of the airspace around the airport and nearby air routes. Trivandrum International Airport has one runway, 32/14, 3,400 m × 45 m (11,155 ft × 148 ft), equipped to operate any type of aircraft in commercial service other than Airbus A380. It has a 1,880 m (6,170 ft) long parallel taxiway. Trivandrum International Airport hosts Air India's Narrow body Maintenance, repair and overhaul unit — MRO consisting of twin hangars for servicing Boeing 737 type aircraft, servicing mostly Air India Express aircraft. The Maintenance Repair Overhaul is set up on 6.07 hectares of land at a cost of Rs. 110 crores it was commissioned on December 16, 2011. The maintenance of two aircraft can be simultaneously done at the two hangars present at the MRO. The facility is state-of-the-art with 5,000SF of workshop, 10,000SF apron, electrically operated and vertically moving hangar door system, warehouse and office space. The Maintenance, Repair, and Overhaul (MRO) facility of Air India Charters Limited (AICL) at Trivandrum International Airport was given permission to carry out the crucial ‘C’ checks of their Boeing 737-800 fleet. Trivandrum International Airport is listed among the major airports of India. Its safety and security is handled by the Bureau of Civil Aviation Security through the Central Industrial Security Force#Airport security (CISF). In the past, the airport security was under the control of airport police (under the state government). However, following the hijacking of Indian Airlines Flight 814 in 1999, the airport security was handed over to CISF. Trivandrum airport also has advanced security equipment including X-RAY Baggage inspection (X-BIS), Explosive Trace Detection System (ETDS) and provision of an In-Line Baggage Screening system; at the NITB, state-of-the-art Closed Circuit Television (CCTV), Flight information Display System (fids) and Public Address (PA) systems, as well as an Interactive Voice Response System (IVRS) for flight information, are there for passengers' convenience. Trivandrum airport is one of the major airports in south India. It plays a major role in the world aviation map, connecting and controlling about nine international air-routes and eight domestic air-routes and provides approach control service to eight major and minor aerodromes. A Terminal Control Area (TMA) is established with a 250 nm lateral limit around Trivandrum airport and a vertical limit of ground to 46,000 ft. The ATC also provides approach control for arriving and departing traffic and is also an Area Control Centre for over flying aircraft and traffic operating from adjacent airports like Cochin, Calicut, Coimbatore, Madurai and Trichy. Trivandrum airport is also a major training centre for ATCOs at the induction level as junior executives. The airport on average handles 350 aircraft movement per day including over flying aircraft. Trivandrum international airport is connected to National Highway 66 (NH 66) which connects the airport to the city and other parts. The National Highway 66 links the airport with the upcoming Vizhinjam International Seaport . Buses connect Trivandrum airport to different parts of the city. Services are mainly operated by the Kerala State Road Transport Corporation which connects the airport to East Fort, Kochi, Kollam etc. The nearest railway station is Kochuveli railway station which is about 5 km away and Thiruvananthapuram Central railway station is about 5.5 km. These railway stations are well connected with different regions of the country. Chipsan Aviation air charter services operating Helitaxi service from the airport to the various locations. Pre-paid taxi services are available from both the terminals of Trivandrum airport. Taxi aggregators Uber and Ola is with in service area. ^ "Traffic News for the month of March 2017: Annexure-III" (PDF). Airports Authority of India. 27 April 2017. Archived from the original (PDF) on 28 April 2017. Retrieved 27 April 2017. ^ "Traffic News for the month of March 2017: Annexure-IV" (PDF). Airports Authority of India. 27 April 2017. Archived from the original (PDF) on 28 April 2017. Retrieved 27 April 2017. ^ "Kerala: Domestic air traffic makes rapid strides". The New Indian Express. 21 April 2018. ^ "Thiruvananthapuram airport targets five million passenger flow". The Hindu. 12 April 2018. ^ "Trivandrum International Airport currently operates two terminals. Terminal 1 handles all domestic flight operations and Terminal 2 handles international flight operations. - Image". Airport Technology. 15 June 2011. Retrieved 5 May 2014. ^ "Trivandrum International Airport, Thiruvananthapuram, Kerala". Airport Technology. Retrieved 1 March 2011. ^ PTI (29 October 2010). "States / Kerala : Kerala celebrates 75th anniversary of civil aviation". Chennai, India: The Hindu. Retrieved 1 March 2011. ^ "Airports Authority of India". Aai.aero. 20 April 2010. Retrieved 5 May 2014. ^ Archive. "Passenger traffic". Hindu.com. Retrieved 27 December 2018. ^ "Experience — On the ground — Airport Lounge". SilkAir. Retrieved 1 March 2011. ^ "The Hindu News Title:World class terminal for Thiruvananthapuram International Airport". Thehindu.com. Retrieved 27 December 2018. ^ Archive. "Airport inauguration". Hindu.com. Retrieved 27 December 2018. ^ "Terminal may put development on fast track". The Hindu. Chennai, India. 12 February 2011. ^ "New terminal for Thiruvananthapuram airport". Deccanchronicle.com. Retrieved 27 December 2018. ^ "Trivandrum International Airport" (PDF). Airports Authority of India. Archived from the original (PDF) on 6 December 2017. Retrieved 6 December 2017. ^ "New upgraded radar at Thiruvananthapuram airport". thehindu.com. 18 September 2013. Archived from the original on 6 December 2017. Retrieved 6 December 2017. ^ "Parallel taxi track at airport completed | Thiruvananthapuram News - Times of India". Timesofindia.indiatimes.com. 24 February 2017. Retrieved 27 December 2018. ^ "Air India's MRO Facility at Thiruvananthapuram Commissioning Today | Some Updates…". Thiruvananthapuramupdates.wordpress.com. 16 December 2011. Retrieved 27 December 2018. ^ a b 2018, UBM (UK) Ltd. "Scoot / Silk Air 2019 network adjustment as of 30NOV18". Routesonline.